When I began almanacking in 1984, I wanted to choose a name that was different from the “farmer” associations of the current best-selling almanack. The logical choice seemed to be to reach back to America’s first and most famous almanack, Poor Richard’s Almanack, prepared throughout the latter part of the 18th century by Benjamin Franklin. Ben had many imitators back then, among them, a certain Poor Will. 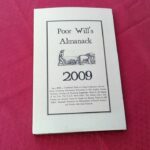 Although it has been almost 200 years since that Will tried to follow in Franklin’s footsteps, I thought it was not inappropriate for William (Bill) Felker to revive the name and the tradition, while making a clean break with the kinds of almanacks currently sold in this country today. 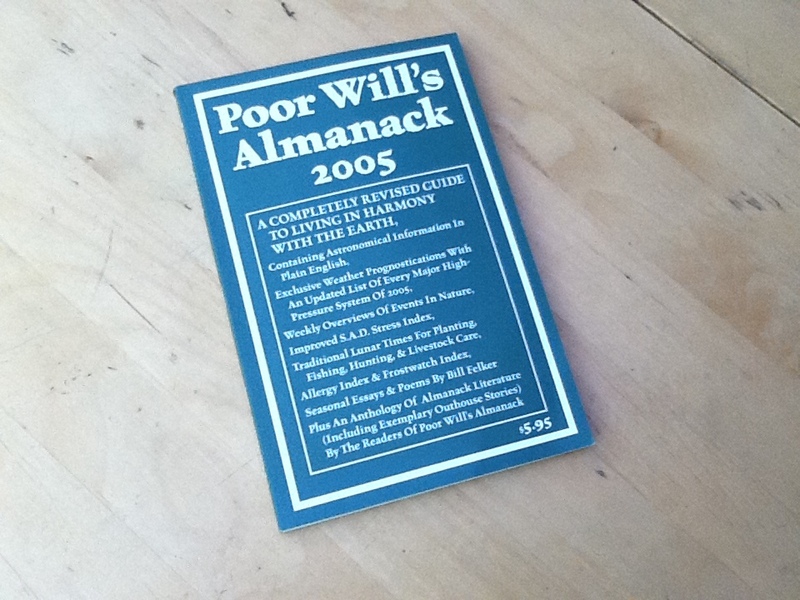 Poor Will’s Almanack is divided into 15 chapters, one for each month between October 2004 and December 2005. Each month contains the sections listed below. Traditional almanacks often contained commentary by the editor. Sometimes these notes were political; often, they were seasonal. 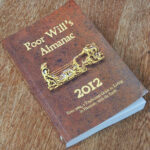 I (Bill Felker) am the author of unsigned poems and essays that appear in Poor Will’s Almanack. Eastern Standard Time is used for all times listed throughout Poor Will’s Almanack for 2005. The weather estimates that appear with each month between October 2004 and September 2005 are based on my charts of fractal weather patterns made between 1978 and 2004. Readers of my weekly and monthly columns throughout the country have used these estimates successfully since 1984. For best results, readers in the East should add 1 to 2 days to specific days mentioned in the overviews. In the West, subtract 1-2 days. The monthly patterns in this almanack have been used successfully in every year since 2005. The Frostwatch charts, which appear in April, May, June, September, October and November, show the chances that frost will have occurred at average locations along the 40th Parallel by the date indicated. The data can be adjusted by adding five percent for each 100 miles north of the 40th Parallel (or for each 500 feet above 1000 feet above sea level). Subtract five percent for each 100 miles south of the 40th Parallel. Although Frostwatch statistics are approximate, they can serve, with interpolation, as a general guide to the advent of spring or fall. Some research and traditions suggest that fish and game tend to feed more when the moon is directly overhead—or directly below the earth about 12 hours later. The monthly keys to lunar position in Poor Will’s Almanack indicate when the moon is above or below the United States, and therefore the periods during which fish and game are typically most active. Since fish and game are also feed more prior to the arrival of high-pressure systems (listed in the Weather Patterns section), your expeditions should be most successful if scheduled one to three days prior to the arrival of each system. 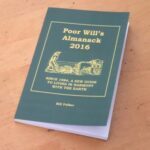 The seasonal calendar section of Poor Will’s Almanack is a collection of 52 summaries of events in nature, one summary for each week of the year. These brief essays describe seasonal changes during a typical year. Each description is a “floating” narrative that can be moved backwards or forwards in time, depending on the reader’s location. For example, the events of “Apple Blossom Week” typically occur in Ohio during April; however, many of those events will occur in March throughout the South, during May in Minnesota. The dates listed between March and September are average times for the first blossoming of each wildflower along much of the 40th Parallel (at 1,000 feet above sea level) in an average year. In a cold spring, blooming can be set back as such as two weeks. If April and May are exceptionally warm, flowers can be ten to fifteen days early. Drought and excessive precipitation change matters, too.Despite such fluctuations and the influence of habitat, the general sequence of flowering remains relatively predictable and can serve as a broad guide for floral sequence across the nation’s midsection. At other locations in North America, once the wildflower year begins, it remains close to the progression listed in this calendar, even though the specific dates may be considerably different. Farming and gardening suggestions are based on likely weather conditions and accepted practices for different times of the year. They also make use of traditional lore about lunar phases. Although definitive proof about the efficacy of these phases has yet to be produced, many farmers and gardeners find that combining lunar conditions with their other routines is satisfying and contributes to their success. Holidays that are especially important to sheep and goat breeders are noted each month. Most of these feast days are observed by customers who often make use of lambs or kids for their celebrations. Buyers from this market can include Pakistanis, Hispanics, Indians, Bosnians, Chinese, Middle Easterners and people of Mediterranean descent. They may prefer to slaughter the animals they purchase before taking them from your property. Average pollen and mold counts are based on average counts made in the central part of the United States and reflect general trends of weather patterns and floral cycles. Current medical opinion suggests that the human brain may need a certain amount of sunlight for maximum wellbeing and that seasonal fluctuation of the body’s natural clock can often bring on shifts of outlook and mood. Sometimes seasonal imbalance can be debilitating; when it is, the problem is often called as S.A.D. or Seasonal Affective Disorder. Knowledge is perhaps the best defense against S.A.D. The S.A.D. Stress Index contributes to that knowledge by measuring the natural phenomena which are assumed to be related to S.A.D.—the day’s length, the percentage of probable sunlight, the weather, and the phase of the moon. In order to create the Index, each of those factors was given a value from zero to 25, and then the four values were combined onto a scale of one to 100. Interpretation is simple: the higher the number, the greater the stress.Index readings are most useful in combination with a record of your own moods. Reference to the Index when you feel out of sorts may be a way of getting a feel for how seasonal affective disorders influence your life.